Francesca Fois is a post-doctoral researcher at Aberystwyth University’s Department of Geography and Earth Science. Francesca is part of the Global-Rural research team that investigates the connections between rural development and globalisation. Drawing on extensive fieldwork in Brazil, China and Italy, Francesca’s research reveals how rural communities respond to global changes, address issues of food security and water supply, and attempt to create alternative spaces, practices and networks. Francesca’s doctoral research explored the social, economic, spiritual and spatial enactment of alternative spaces such as intentional communities by critically interrogating the themes of utopianism and heterotopia. 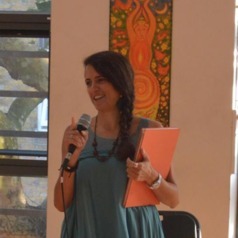 Since 2012, Francesca has been collaborating with the shamanic intentional community of Terra Mirim (Brazil), organising a series of public events about communal living and shamanism and supporting their recent mobilisation against the construction of a landfill in a protected area of the Atlantic Forest in the Metropolitan Region of Salvador (Bahia).